When the lights go out for showtime the tables "glow" in the dark. The show room lights are left on prior to the show in order to "charge" the table tops. The glow in the dark laminate was imported from Italy and the tables were constructed right here in Erie by Lignitech inc. Jr's is the only comedy club in the country using these tables. 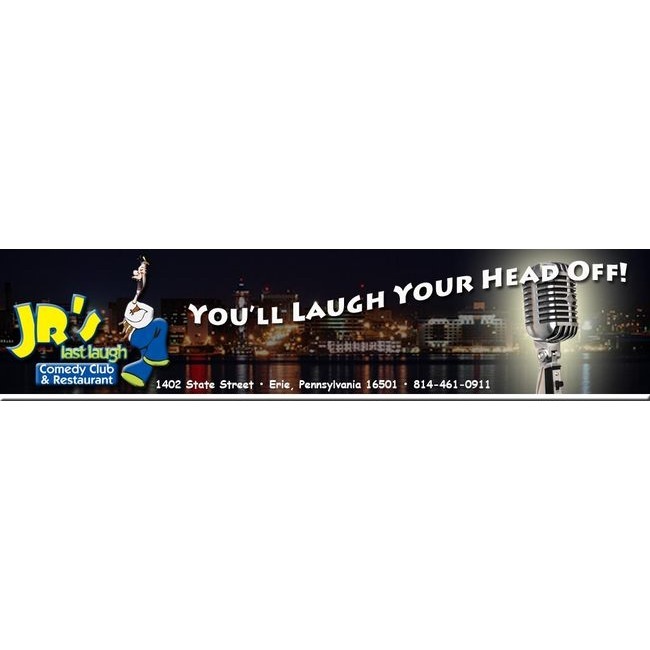 The BLUE GOOSENECK LIGHT that hangs over and behind the comedians was from the original portable "Jr's" last laugh stage and has been with us since our very first show. The architect specified a new fancy light for the stage but we wanted this one to continue on with us. It was originally borrowed from Modern tool square for our temporay venue and a year later officially given to us for the grand opening of our now permanent home at 1402 State. St.
"JAKE" is the brown chocolate lab statue on our stage. The statue was given to Doug by his mom for his birthday. Doug and Debbie have a real chocolate lab at home named Jake and Dougs mom felt that it would be nice to also have the dog hanging out at the club. 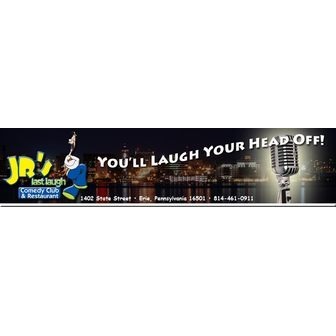 Jake has been teased and toy'd with by some of the funniest comedians in the buisness from David Brenner to Reed Rankin.